According to several guests booked for the Carnival Freedom departure today, a notice has gone out that the ship will now leave at 7:00 PM with the final boarding time at 6:00 PM. Many people traveling to the ship in Port of Galveston Texas have been delayed due to significant flooding. CARNIVAL FREEDOM will not sail out before 7:00PM today. There is a FLASH FLOOD WARNING in effect!!! Please exercise caution on the road and "turn around, don't drown". Carnival Cruise Line has issued a weather alert for Galveston where two Carnival cruise ships will depart over the coming days. This is due to heavy rainfall which could impact guest traveling to their cruise. The Miami-based cruise line has issued a travel alert as guests heading to and from Carnival cruise ships in the Port of Galveston could be impacted. There is heavy rain in the area which has caused traffic issues by road closures. According to local weather reports, there will be constant rain through Sunday and then on Monday, October 1st a 50 percent chance of rain. Thunderstorms are expected through Thursday. One to two inches of rainfall is expected for Galveston which has already started flooding many areas. Interstate 45 (southbound) will be closed from 9:00 PM, Friday, September 28 to 5:00 AM, Monday, October 1. The closure will be from FM-518 to SH 96/Calder/Brittany Bay in League City. Traffic will exit at FM-518, continue along the southbound frontage road, and re-enter at the SH-96 entrance ramp. From September 28 to October 1 Interstate 45 Southbound will be closed. Those guests traveling to join the Carnival Freedom on Saturday will need to follow official updates from the cruise line for the latest updates. Carnival is monitoring the weather conditions at its Fleet Operations Center in Miami, Florida. The ship is scheduled to depart for a 7-night sailing to the western Caribbean. Our Fleet Operations Center in Miami has been actively monitoring the weather forecast for the Galveston area. Heavy rain, which may cause street flooding, is expected over the weekend. Please allow ample time to arrive at the cruise terminal within your scheduled Arrival Appointment. However, as everyone’s safety is our number one priority, we ask our guests to remain safe and follow all recommended precautions. We are currently planning to operate our cruise as scheduled but we will continue to keep an eye on local conditions and provide you with an update if anything changes. We are looking forward to welcoming you aboard for a FUN and memorable cruise vacation. Carnival Vista has a scheduled 7-night Western Caribbean cruise set to depart the Texas port on Sunday and even passengers traveling to Royal Caribbean’s Liberty of the Seas Sunday departure may need to check before traveling. 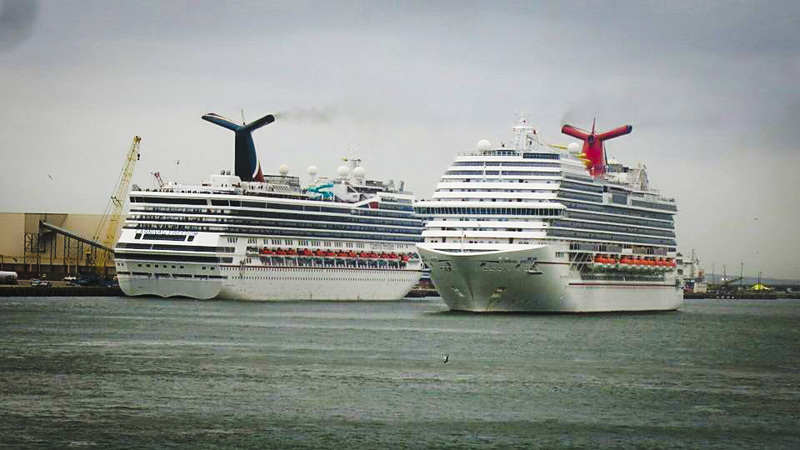 Galveston is a major cruise port which is often hit by bad weather conditions during Hurricane season and also fog during other times of the year. Earlier in the month, we posted about flash flooding in Galveston, but thankfully there were no major cruise delays, and guests managed to enjoy their fun vacation. Hopefully, it will be the same case over the next few days.